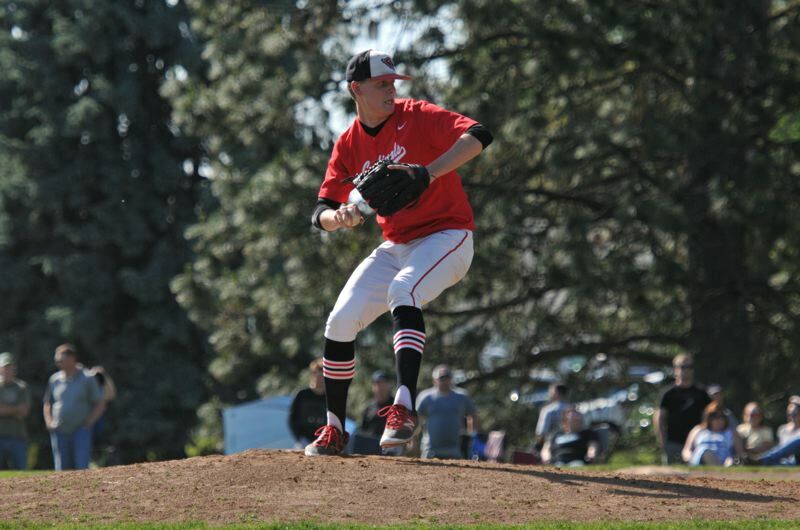 Lincoln High pitcher Zane Mills will be all business when he takes the mound in the Oregon All-Star Series this weekend. Mills, a right-hander who has signed with Washington State, will compete for the North in three games against the South. The annual event brings the top seniors in the state to Goss Stadium. Game 1 begins at 7 p.m. Saturday. The series concludes Sunday with an 11 a.m. doubleheader. Outfielders Matthew Easton of Lincoln and Nick Markantonatos of Grant also are on the North. Mills was all-Portland Interscholastic League and all-state and PIL Pitcher of the Year this year, after making honorable mention all-PIL as a sophomore year and the second team in 2017. He developed nicely, even though he never saw a private pitching instructor. "People now think in order to be good at baseball, you have to have private coaching, but Zane just put in the work on his own," Lincoln coach CJ Watson says. Easton says Mills spends the majority of his time either working on or watching baseball or studying the game. Mills also works out four or five times a week, focusing on upper and lower body strength. A 6-4 right-hander, Mills attacks hitters with a two-seam fastball in the mid-to-high 80 mph range, and he augments that with a slider and changeup. "One thing I really found effective as a pitcher is to attack hitters right off the first pitch," he says. "I don't like to nibble around any hitters. I want to keep my pitch counts as low as possible." Though driven by his baseball and academic goals, Mills is different when he isn't pitching. Watson and Easton say he's a goofy and upbeat teammate. Mills is known for being the guy who makes everyone laugh and has a bizarre sense of humor. "I can't even describe his sense of humor," Easton says. "He just laughs at everything, and it's wacky and so unique. He's just always laughing and having fun." Mills also enjoys himself when the time comes to pitch, but it's different. "Then he turns into a pitcher who wants to strike out as many guys as he can," Easton says. "When he gets on the mound, goofy Zane becomes a different person," Watson says. "It's all business for him out there. You can tell he's having fun, but he's not smiling anymore. He's going to give you everything he's got from his first pitch till his last." Some of Mills' off-the-field personality seeps into his pitching, though. "He's kind of like Max Scherzer, where he walks around and sort of mumbles to himself on the mound," Easton says. "But then he narrows his eyes, looks at you, and you can see in his eyes that he knows he's going to beat you." Mills will attend WSU on a full scholarship. But he initially saw himself as an NCAA Division II or III talent. He always had the dream of going D-I, but first set his sights on playing for a lower-level school. At Lincoln, he was bumped up to the varsity as a sophomore and continued to rack up strikeouts. "I was really surprised, playing older teams and having success against them," he says. "That's when I realized I could have success at a higher level." Even then, however, Watson and Easton saw things differently. "It's not too often you watch a guy play in eighth grade and think, 'Wow, that guy has a chance to be really special,'" Watson says. "But with Zane, I knew it right off the bat watching him throw. Mechanically, it wasn't good, but he had that real live arm and made everyone swing and miss." Easton, who will attend the University of Oregon, was born in Portland and moved to Shanghai when he was 7. He did not move back to the United States until eighth grade. Easton and Mills met for the first time when starting high school together. Easton's first impression of Mills came on a different field. "I first saw Zane playing football my freshman year when I moved back, and he was already 6-3 and 205 pounds. And I was like, 'Whoa! Who is this guy?'" Easton says. "He was playing quarterback, and I was a receiver, and he was just zipping the ball in there. I knew that if he worked hard all four years and committed to it like he did, he would be something really special." Mills still was not convinced. He switched to the defensive line and gave thought to focusing on that sport in college. But he knew he was undersized for that position and so refocused on baseball. He competed in prospect evaluation camps with Baseball Northwest during his sophomore and junior seasons. It was there he received his first D-I interest; Oregon State associate head coach Pat Bailey gave him a call. Mills competed for the Seattle Stars, a club baseball team, last summer and began to communicate with WSU. Stars coach Guy Keller connected Mills with WSU coach Marty Lees and pitching coach Dan Spencer. Mills also received offers from Cal State Bakersfield, Seattle University and the University of Portland. He kept in touch with Bailey and the University of Washington as well. "(UW) could not ever offer me any money because they had already committed full scholarships to other players," Mills says. "It was a similar deal at Oregon State, where they said I could be a preferred walk-on, but I didn't want to do that." Lees and Spencer have national championship pedigrees, having coached on OSU's 2006 and 2007 NCAA title teams, but Mills says their experience winning at a high level didn't factor in his decision. "They liked to talk to me, and that was really awesome. Just talking to them made me want to go to Washington State," he says. "They were really open with me, and it feels really good to be wanted by a coaching staff and a program." Mills intends to major in sports marketing and minor in sport management. WSU has finished at or near the bottom in most major statistical categories on the mound in Lees' first three years at the helm. The Cougars are coming off a 16-33-1 season. Mills says he is confident the 2018 recruiting class, which Lees says is his deepest yet, can make an immediate impact. Lees intends to convert Mills into a reliever. Watson says Mills is good enough to be a college starter but has the tools to become a fixture at the back end of the bullpen. "I think closing or coming out of the bullpen suits me, really," Mills says. "Just because I don't throw the hardest, but I can mix it up and my ball has a lot of movement. I can fool hitters and keep them off-balance. It's not a starting role, but it's the next best thing." Mills will leave for Pullman, Washington, at the end of the month. After going through orientation at WSU, he will participate in the Cougars' five-week summer training program alongside eight other incoming freshmen. Mills also will complete a pair of undergraduate core requirement courses. Before that, though, Mills will fulfill the final goal of his high school career at the All-Star Series. The nice side of his personality intersects with what he hopes to get out of the experience: "Just creating relationships with the players. I personally think relationships are everything. I don't particularly like holding grudges against anyone or being mean." But when it comes time to take the mound, Mills will flip a switch just like he always does. "I think we've got a little bit better hitting, but (the South) has a little bit better pitching," he says in breaking down the series. "I think I'm probably one of the better pitchers for the North." Sharing the field one last time with Easton, also an all-stater, is just as significant as the game for Mills. "It's such an honor to share this incredible experience with him and play with him one last time, since I know he's going to do great at WSU," Easton says. Watson says he will try to make it to Corvallis for at least one game of the series to see Mills finish as a high school player. The coach anticipates staying in touch with Mills and talking to him at least twice a month. "My biggest message to Zane will be, 'Don't change who you are.'" Watson says. "A lot of players struggle with that transition and facing 22- and 23-year-old kids, but Zane is someone who can handle it at 18-19 years old. "There's a lot of good people believing in him, people who know he can have success right away."